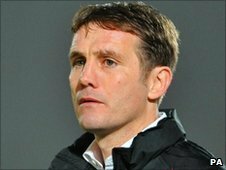 Charlton Athletic have sacked manager Phil Parkinson while first team coach Tim Breacker and assistant boss Mark Kinsella have also left the Addicks. The 43-year-old was named permanent boss in December 2008 following the departure of Alan Pardew. The Addicks, who were beaten 4-2 by Swindon on Monday, last won in League One against Yeovil on 20 November. Charlton chairman Michael Slater told the club website: "Clearly improvement is needed on the field." Charlton were taken over by a group represented by former chief executive Peter Varney on 31 December. Slater added: "The team has not won in the league since November and recent performances have simply not been good enough. "Last night's defeat convinced us as a board that change is required now we are still in the hunt for promotion, and that we must appoint a new manager to give us every chance of going up." The Addicks are fifth in League One, three points off the automatic promotion places. Parkinson previously had spells as manager of Colchester United and Hull City.